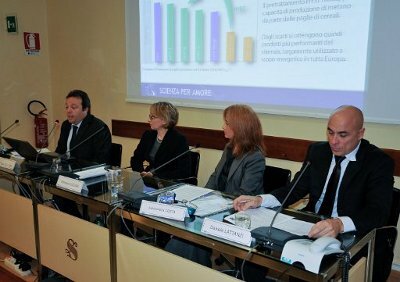 On 29 November 2012 – in the Italian Senate’s Conference Room of Palazzo Bologna – a meeting was held on “Hyst Technology for Food Security”, where guidelines for implementation of the Bits of Future: Food for All Project were presented to the Governments concerned. This meeting, organized by the Scienza per Amore Association, was attended by representatives of the Embassies of Algeria, Burundi, Burkina Faso, Chad, Ethiopia, Ghana, Guinea Bissau, Lesotho, Morocco, Rwanda, Senegal, South Africa, Sudan, Uganda and Zambia, as well as representatives of the MISE (Italian Ministry of Economic Development), the Unione Petrolifera (oil industry trade association in Italy) and prominent Universities. The meeting proceeded with a speech by Eng- Franco Del Manso of the Unione Petrolifera, who said that first-generation biofuels often compete with the need to reserve raw materials for the production of food. “With this technology it is possible to produce second generation biofuels whose characteristics are fully compatible with the technical requirements of the transport sector. This is why Unione Petrolifera is interested in the development of this technology. […] We look forward to being able to contribute to the development of this technology with regard to the energy aspect, which is intended to support the more noble aspect, that of food security and the fight against hunger and poverty”. Alessandra Costa, Director General of BioHyst Company, then explained: “Our intent to provide this technology free of charge was supported by the World Bank, which could provide financial support to countries that do not have the economic resources to set up a complete industrial hub. […] It is essential now for the Governments concerned to express their determined will to avail themselves of this opportunity. This determination will be the real driving force of the Project”. In closing the meeting Dr. Daniele Lattanzi, BioHyst Business Development Manager, provided an update on the state of the art of the Project: “Hyst Technology has proved a success with all the interlocutors we have addressed, even abroad. But we are trying in every way to stay in Italy, where we hope to start up the industrial aspect and give new life to some economic sectors, together with the involvement of Government Institutions and the Ministries concerned.” He also drew attention to the events that led to the seizure of the Hyst machine: “From the moment we signed the agreement to acquire the technology package, a series of events began creating discomfort to the inventor and to the association. […] Next week the release of the impounded Hyst unit is to be discussed. Whether it is released or not we will in any case inform the authorities of this serious situation, which is likely to cause Italy to lose a unique opportunity”. Many among the Government representatives present expressed their will to take part in this initiative. The Ambassador of Burundi, His Excellency Mr. Rénovat Ndayirukiye, commented: “This program provides multiple benefits, from the industrial, food and fuel point of view. We, who do not have oil, are very interested […]. All African countries will rise to show that whoever is blocking the project is making a big mistake. We are ready to support this Project”.